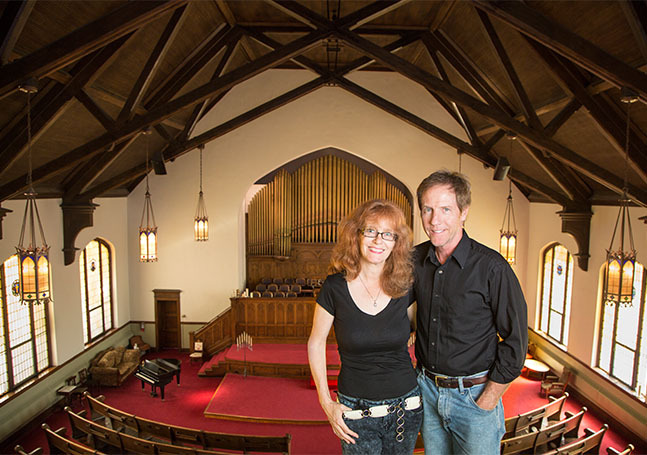 In 2012, the Wittnebels purchased the former First Presbyterian church building at 501 Prospect St., and transformed it into a performing arts center called The Castle. The venue is available for use by the Beloit International Film Festival, Beloit College, Rock River Philharmonic, as well as special events such as weddings, corporate events, and presentations. The Wittnebels had seen a similar project done in Minnesota, where a worn-down church was brought alive when it was converted into a performing arts center. “We can do that here,” thought Jody. They consulted with Beloit College, the Beloit Film Festival and the City of Beloit, who all gave them encouragement. So the couple bought the building and began the painstaking process of refurbishing The Castle, doing a majority of the work themselves. They painted walls and replaced flooring among other things. The main room maintains its beautifully-curved oak pews and stained glass windows. “My husband loves history; this was perfect for us,” she says. Jody owns a marketing agency called Hourglass Media, a photography and videography studio and John is a pilot for American Airlines. Brittnay handles the marketing and son, Johnny, is a music teacher at The Castle. In addition, the Wittnebels recruited Greg Gerard, a Grammy-winning Beloit musician and director of operations for the Beloit Film Festival, to help manage programming at the facility. Jody says there will be a focus on family friendly events at The Castle, with concerts for teenagers as well as special events and educational activities for parents and younger children. The Castle will give young artists a place to perform, and others a chance to enjoy and learn about the arts. The Castle is also about attracting visitors to Beloit.